The relationship between diet and cancer; Occurrence and significance of carcinogens in foods; Diet and tumour initiation; Diet and suppressing tumour development; Diet and Immune mechanism. 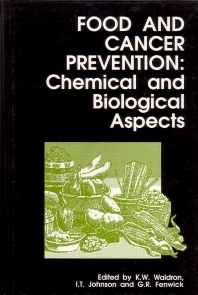 Food and cancer prevention: Chemical and biological aspects is the first book to be published on this subject and represents the current state-of-the-art. It is interdisciplinary in scope and provides researchers from around the world with the opportunity to bring themselves up-to-date in this vital area. Food and cancer prevention: Chemical and biological aspects covers a topic which is attracting considerable attention and aims to promote constructive collaboration among clinicians, toxicologists, nutritionists, food scientists, epidemiologists and plant scientists worldwide. It is an essential reading for anyone involved in research in to this subject and will also be of interest to government departments, with a view to legislation, and food manufacturers producing functional, novel or health foods.